It's been a busy morning here in Oxford, which kicked off with Malcolm Atkinson beckoning us into the first session in the style of a town crier. It's certainly one way to attract a crowd.. The first two talks of this morning were given by Ken Miura from the National Institute of Informatics, and Jeff Dozier who explained the importance of data collection with regards to earth science and his particular interest, water resources. I'm now sitting in the Arts and Humanities session, where we've just learnt about the CLAROS project from the University of Oxford. CLAROS aims to bring classical art to a global public. They're building a humanities dataweb which will incorporate objects such as sculpture, pottery and gems. They also aim to build an interface to open up the contents to users from scholars to schoolchildren. Partner institutes to date include the Beazley Archive in Oxford, the Research Sculpture Archive at the University of Cologne and the German Archaeological Institute (see here for more). They are also working with the Lexicon of Greek Personal Names in Oxford in a first attempt to incorporate information that reaches beyond classical art. As for many of the community, CLAROS aims for semantic rather than textual search. For this they have to integrate these distributed and heterogeneous archives which include 2 million different records altogether. To connect these disparate database technologies, CLAROS maps between them, without changing the individual databases themselves. CLAROS wants to become a testbed for performance research as well as aiming to change the approach of data discovery to explore information. They are also working on innovative searching bases on shape analysis. 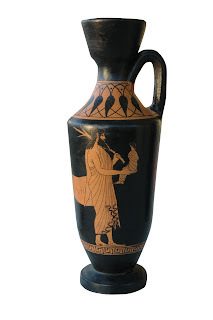 For example, if user is looking for an amphora – a type of vase – they could simply take a photo of what they're looking for on their phone and CLAROS would find it in the database.